Spring is the time for flowers, warmer weather and cleaning. It’s the season when householders spring into action to tackle the year’s mess. So, where did spring cleaning come from? To clear things up, we spoke to Stephen Munton, founder and director of the Domestic Cleaning Alliance (DCA). When Did Spring Cleaning Start? Spring cleaning goes back to a time when oil and wood heated homes in the winter. On a warm spring day, the whole family would clean the soot and grease away. Nowadays, a spring clean is simply a big clean in the spring. Does spring cleaning have a place in modern living? Opinions are split: some support spring cleaning, while others think regular cleaning is more effective. Everyone has different routines, but don’t wash your hands of spring cleaning just yet. “I think the idea of a spring clean is very dated and the need to do a full, deep clean each spring is long gone. I’m a great advocate of cleaning-as-you-go, so there shouldn’t be that much to do for a spring clean. As every home is different, there’s no one-for-all cleaning remedy. You’ll need to consider how dirty your home gets and how quickly. As all cat and dog lovers will agree, a pet-friendly home can get messy in no time! Why should we bother with thorough cleans, anyway? There are endless reasons. Most importantly, cleaning makes your home more hygienic, preventing illness from spreading in the family. It may surprise you that some areas of your home harbour more germs than a toilet seat! Before you organise your home, organise yourself. Making lists can help you get your home spick and span in no time. Make cleaning easy by planning what you need to buy and what you need to clean. For busy households, order your plan of action. In each room, start from top to bottom to easily sweep up any falling dust. Small things like this can make a big difference to the time it takes to clean. Being prepared is key. Deep cleaning doesn’t have to be a chore. Think of ways to make it more exciting: perhaps turn it into a workout or tune into your favourite music channel and waltz around the house in a jiffy! Time flies when you’re having fun! Before cleaning your house, you need to clean up your act. The less you own, the less there is to clean. Declutter by getting rid of the things you don’t need, and organise the things you keep. We asked Kate at the Association of Professional Declutterers & Organisers for her thoughts. Clearing up after yourself is common sense, but it’s important to get into a routine. Even if something looks clean, it’s getting dirtier by the day, so remember to clean even if you think it isn’t needed. Staying on top of chores prevents the need for a big spring clean, saving time in the long run. Kate adds: “Engage in mini clean sessions and the task will feel far more manageable. Clean up spills as they happen, vacuum daily and store cleaning equipment in multiple parts of the house to encourage consistent care. Reduce your workload by getting the whole family involved. Even the kids can take on less strenuous tasks like dusting. Everyone knows to clean the most obvious places. However, it’s important to target all places where dirt can collect and harbour germs. Yes – that’s almost everywhere! Luckily, regular cleaning and a checklist will make this much less daunting. So, where are the common places we forget to clean? How dirty is your carpet? It’s one of the worst culprits for dirt and grime – don’t look down! It comes into regular contact with feet, shoes and paws. As a result, dirt gets deep into its fibres. It’s also the perfect place for dust to collect, so­­­­­­­­ watch out for dust mites! And guess what? Vacuuming isn’t enough. Your carpets need a deep clean to stay healthy­ and Rug Doctor has your prescription sorted. Stephen adds: “The floor will always be one of the dirtiest parts of any building. Carpets are constantly being walked on, so dirt and filth are trodden into the pile. By cleaning carpets, they will look better, feel better, and very often smell better. For the places not cleaned often enough, spring cleaning is the perfect time to tick them off your list. With warmer weather to encourage faster carpet drying, there’s no better time. If your mattresses have never been cleaned, don’t sleep on it. Not only can Rug Doctor tackle your carpets, but it can also get your mattresses and upholstery fresh as a daisy. Just use the Hand Tool attachment included with your rental machine. 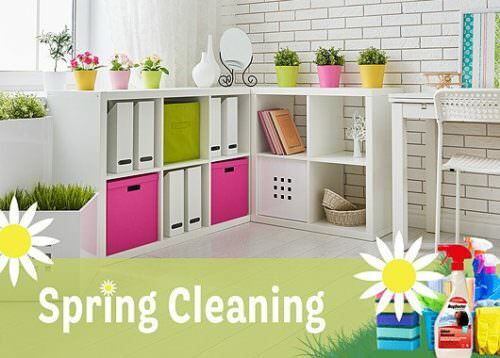 Clearing up as you go can make spring cleaning a breeze. Keep your carpet and upholstery fresh with a range of products to wave stains and odours goodbye. Even better, prevent the need for a cure with constant care. When it’s time for a good old-fashioned clean up, spring is the perfect season. After a dazzling spring clean, you’re all set to enjoy the summer. With a tidier home, you’re sure to have a spring in your step! This entry was posted in House Prep, Hacks. Bookmark the permalink.